With Virtual Reality set to make a huge splash at E3 2015 this week, it may very well prove difficult for Oculus, Sony and Steam to top the unveiling of a new VR headset from Swedish game studio Starbreeze (The Chronicles of Riddick: Escape from Butcher Bay, The Darkness), currently dubbed Project StarVR. The project follows the studio’s acquisition of French VR company InfinitEye, which had been developing its VR concept under the name InfinitEye HMD since 2012. 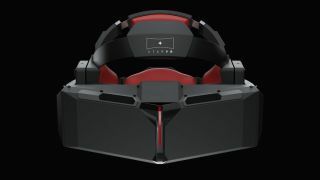 Project StarVR boasts some impressive specs which look set to give the much-publicised Oculus Rift a run for its money, including a massive 210 degrees field of view (compared to Oculus’ 100 degrees) and dual 5.5 inch Quad HD panels with a resolution of 5120x1440 (2160×1200 for the Oculus Rift CV1). With that said, your PC is also going to have to boast some pretty impressive specs if it hopes to take on Project StarVR’s proposed level of visual grandeur. We ride to Valhalla - Shiny and Chrome! The headset will work in conjunction with the Valhalla Engine, which the studio acquired last month, and will be used to display PayDay developer Overkill's forthcoming adaptation of The Walking Dead on the E3 2015 show floor. The Valhalla engine reportedly "supports not only 3D but is fully virtual reality (VR) ready, and proofed on several headsets currently on the market." We look forward to seeing whether Project StarVR will have what it takes to stand out amongst the likes of more well known VR quantities such as SteamVR, Oculus Rift and Sony's Project Morpheus at E3 this week. Who’s closest to making VR a reality?